The lovely church of St Margaret’s in Hemingford Abbots was the setting for Tapestry’s most recent concert on the 23rd March. The programme was chosen to reflect the theme ‘Joy and Woe are Woven Fine’, in acknowledgement of both Lent , and the Feast of the Annunciation, or Lady Day, on the 25th March. The programme ranged from the Renaissance music of Palestrina, Byrd and Tallis to more modern composers such as Elgar, Dubra and Holst. The audience also particularly enjoyed the inclusion of secular songs such as Somewhere over the Rainbow, Once Upon a Dream and Billy Joel’s Goodnight my Angel which reflected the themes of Joy and Woe. The retiring collection from the appreciative audience raised £256 for Jimmy’s Night Shelter in Cambridge. Tapestry sang to a packed house at their annual Christmas Concert held in the Free Church on the 17th December. It was a rich and varied programme of carols, songs and readings which delighted the audience. The retiring collection raised an amazing £1000, which was donated to Epilepsy Action - Tapestry’s chosen charity of the year. Highlights of the concert can be heard on Radio Cambridgeshire’s ‘Classical Cambridgeshire’ programme which was broadcast on the 20th December. Tapestry were delighted to welcome Mark Liversidge from Radio Cambridgeshire to their Christmas concert at the Free Church in St Ives on the 17th December. After the concert, Mark carried out some interviews with members of the choir. Highlights of the concert and the interviews were then featured on his show - Classical Cambridgeshire. Follow this link and you’ll find Tapestry featured between 1.03 and 1.55. Tapestry were invited to join singers from around the world to perform the U.S. premiere of Patrick Hawes new work The Great War Symphony’, written to mark the centenary of the end of World War 1. 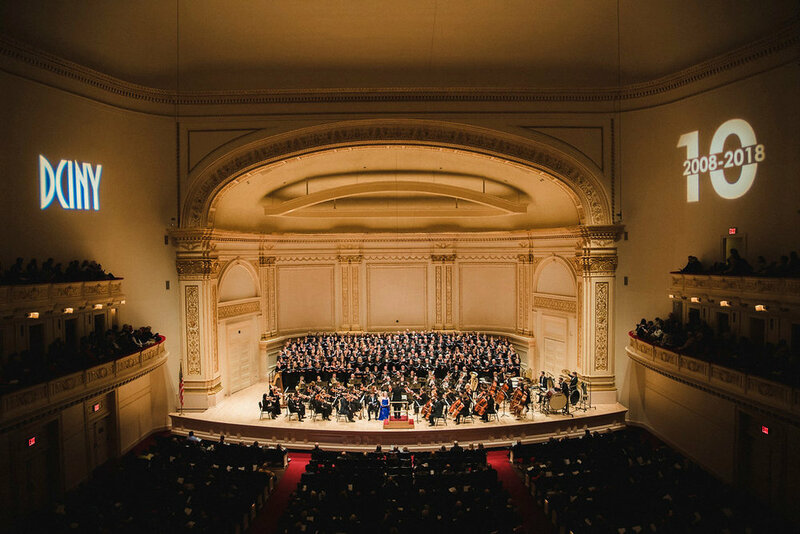 The premiere took place in the Carnegie Hall on Armistice Day and was a very uplifting and moving occasion for all involved. Please visit our Gallery page to see more photographs from the event. Tapestry joined forces with Brampton and Wyton Military Wives Choir for a very special remembrance concert on 3rd November in St Margaret’s Church, Hemingford Abbots. The audience heard a wonderfully eclectic selection of music, both sacred and secular, which reached over a period of 500 years. The highlights including a setting of Bridge of Troubled Water, including a solo from tenor Tony Humes and a choral setting of Elgar’s famous Nimrod. The evening finished with a very appropriate joint item - a new adaptation of ‘You’ll Never Walk Alone’ in which the song is interwoven with the tune from Beethoven’s Sonata Pathetique. This was written for the choirs by Jeremy, Tapestry’s own Musical Director. Donations from the audience raised £470 to be shared between the SSAFA charity and St Margaret’s Church fund. Rumour has it that the concert was so successful, there may be a repeat some time next year! On October 20th, the United Reform Church in St Neots hosted a Tapestry Concert in support of Christian Aid. The audience were delighted with the varied programme and the quality of the singing. Highlights included Palestrina’s Nunc Dimittis, the spiritual Deep River, Franz Beibl’s Ave Marie and the madrigal The Silver Swan. The programme finished with a new version of You’ll Never Walk Alone adapted by our Musical Director Jeremy, which the audience loved. Please visit the ‘Listen to us’ page to hear some excerpts from the evening. It was a great evening and we were delighted to hear that the event has raised over £940 for Christian Aid. A new recording has been uploaded to our Listen to us and SoundCloud pages. In honour of Barbershop Quartet Day, I've chosen to upload the men's performance of 'We were gathering up the roses'. Enjoy! We currently have a vacancy for a tenor. You must be able to read music and commit to regular rehearsals. The ability to sight-read and experience of singing in a small group would be an advantage.. If you're interested, contact us for more details. Tapestry will be joining forces with Huntingdon Male Voice Choir for a concert on 23rd June in St Mary's Church, Burwell during the Isle of Ely Arts Festival. We're very excited as this is the first time that the two choirs have come together to share a platform, despite both being based in Huntingdon. We have some very exciting news - we've been invited to take part in the US premiere of Patrick Hawes' Great War Symphony. We'll join a massed choir of singers from around the world at Carnegie Hall in New York on 11 November, to premiere this new choral symphony marking the end of the First World War centenary commemorations. Want tickets? Keep your eye in our site to find out as soon as they become available.